1) A mother is twice as old as her son. If 20 years ago, the age of the mother was 10 times the age of the son, what is the present age of the mother? 2) Four years ago a man was 6 times as old as his son. After 16 years he will be twice as old as his son. What is the present age of man and his son? 3) The ratio of the ages of Minu and Meera is 4:2. 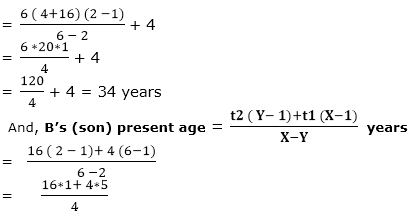 If the sum of their ages is 6 years, find the ratio of their ages after 8 years. Let the age of Minu is 4X and age of Meera 2X. 4) The ratio of the ages of Seeta and Geeta is 2:7. After 6 years, the ratio of their ages will be 1:2. What is the difference in their present ages? Let the age of Seeta is 2X and age of Geeta 7X. 5) Ten years ago, the sum of ages of a father and his son was 34 years. If the ratio of present ages of the father and son is 7:2, find the present age of the son. Let the present age of the father is 7X and present age of son is 2X.